Let’s embrace the digital age and conduct an author visit on-line! Of course, nothing can replace meeting face-to-face, but if your author visit budget is tight, I can visit your classroom or school via the Internet. Click here to download my detailed PDF document entitled Virtual Author Visits With Ken Derby to discover how your school can have a successful author visit with me using Skype, Google Hangouts, or FaceTime. Normally, it costs $1,000 when I visit schools. However, my virtual author visit is a bargain when compared to an on-site visit. Please note that after requesting a virtual author visit, I will contact you so that we can schedule an exact date and time for the virtual author visit. After we have agreed upon a date and time, I will send you an invoice that will link to PayPal, so that you can make a secure payment. You will have the option to make your purchase via your PayPal account or by credit card (if you don't have a PayPal account) in your local currency. Please click here to request a virtual author visit. My virtual author visit service is featured at Skype an Author Network. Ken Derby’s Virtual Author visit (via Google Hangouts) with fifth grade kids at Alice Gustafson Elementary School in Batavia, Illinois, USA. Click here to view a slideshow from the virtual author visit. "After reading aloud three of Ken Derby’s books, our 5th grade class was eager to meet Ken. We emailed him requesting a Skype author visit and he made the time for us. The kids were inspired by the humor in his book and the unique character that is Ken Derby. As writers, I often observe our students using Ken’s books as models for their own writing. Ken relates well with students and has the ability to empower the future authors of tomorrow." "Ken Derby's author visit via Google Hangouts allowed our 5th grade students to travel around the world without a passport all the way to Budapest, Hungary! 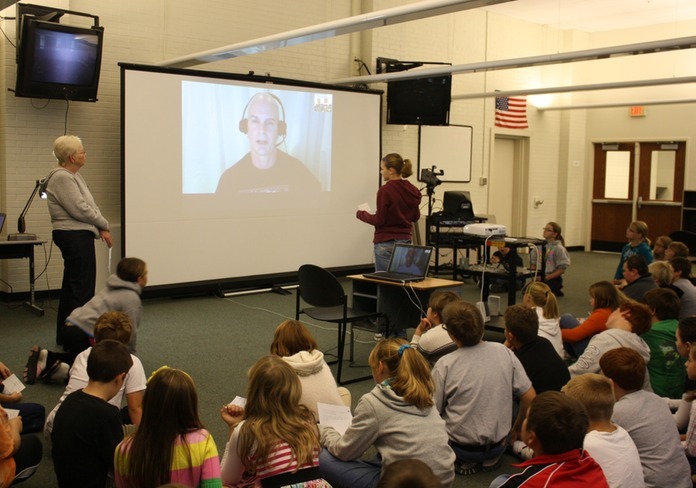 Through this authentic learning experience, students were able to personally connect to a role model who inspired and motivated to become better writers and readers during his engaging and interactive online visit. Google Hangouts offered added benefits beyond the video-conferencing. Ken was able to share true examples of editing/revision feedback, a first-seen cover of a new book, and several slides highlighting his own interesting background! The format offered teachers and students a chance to extend learning beyond the walls of the classroom, to get answers from an expert to their questions in real-time, and to see that anything is possible!" “I liked the video chat a lot. I thought it was great to ask questions to Ken Derby. I understood the book more than before.”-D.M.“I thought Ken Derby was really nice. It was so cool Skyping with him! I learned that he lives in Hungary. His book was so much fun to read! I hope to read another book he writes.”-H.C.
“I thought that Ken Derby was really funny. I learned that he is a 5th grade teacher himself.”-C.G. “I think that Ken Derby is a terrific and funny author!”-K.S. “Our fifth grade book club meeting was awesome because we got to actually see the author, Ken Derby.” -R.D. “I loved our Skype author visit with Mr. Derby. I thought he was nice, funny, and creative. He seems like a great guy.”-P.D. “I think that Ken Derby is really funny and a really good writer.”-M.M. “Ken Derby is the Best Author Ever! He’s so cool!”-A.L. "Our principal here at our school inquired about putting together a Reading Night for our students, and I knew I wanted to think "outside the box" a bit for our main presentation. While author visits are good for the kids, I wanted to integrate technology to prove to the students that sometimes adults can be cool too! Our virtual visit with Ken fulfilled both hopes and while a real visit with him would have been great, the kids were drawn to the idea that we could talk to him live while he was across the world. This also introduced a bit of cultural discussion to our chat as well as the writing process. I enjoyed, as much as the students, learning about Hungarian culture and a little about the school he teaches at. His explanation about the writing process and the difference between revising and editing was extremely understandable for the kids. He also stressed that he rewrote and rewrote, and it wasn't something teachers made students do just to torture them! He didn't sugarcoat the competitive nature of publishing, but encouraged the kids to write, write, write, and to challenge themselves to be the best writer they can be. Being a librarian, I loved how he explained that he was a better writer because he was an avid reader! We couldn't be happier with how well thought out and "cool" the whole hour went - actually longer than that because he stayed a few minutes more to answer our students' questions! Now perhaps I'll get him on board to teach virtually for me also, and I can have a day off! Try a virtual visit - you just may like it!" Check out Holland Elementary Gifted Cluster Students Write to Two Authors . . . and Get Two Replies! “After reading The Top 10 Ways to Ruin the First Day of 5th Grade (renamed The Top 10 Ways to Ruin the First Day of School) to my students I wanted to thank Ken Derby for his entertaining novel. I found his website and saw that he made author visits both in person as well as virtual visits via the computer. Because of the great distance and teaching in a financially strapped school district, a virtual visit was the best option, and it was fantastic! Ken is down-to-earth and had a great rapport with the students. Ken spent one hour with my 75 plus students, and they were attentive the entire time. He called them by name, and even though there were thousands of miles between us, it was like he was in the room with all of us. I highly recommend this kind of visit! Thanks Ken!" Click here to access a press release from the Bethel Journal. Click here to see a photo from the press release. “My class loved their virtual author visit with Ken Derby! Not only did they enjoy his sense of humor, but they also really benefitted from his honesty and willingness to engage them as students and as individuals. The students started the visit wanting to know more about Ken’s book The Top Ten Ways to Ruin the First Day of School. But, as the presentation went on, and more and more students’ questions were answered, it became more about Ken Derby the writer. My students really took his advice about becoming better writers and possibly becoming published authors to heart. As a teacher, I loved how willing Ken was to answer individual student questions, and also how he used humor, and personal stories to get his message across. As an added benefit, my students loved hearing his stories about the places he has lived, worked, and visited. It brought a ‘world’ perspective into our classroom. Thanks Ken, we loved your visit!"